This will be the first year my son will go with me winter camping. He has only been in Scouts for two years (taking a break this year) and his mum is now comfortable with the idea too...she and our daughter not interested, yet. I am putting my gear together...I have only done it solo with candles or small gas stove. (I am not counting work or hunting trips). To me, the tent is fairly simple, Seek Outside are easier to obtain in Canada and the price point beats Hilleberg. I am pretty convinced on the Seek Outside Cimarron but, I not sure of their stoves. They look and sound good in description and on YT reviews. I never pulled the trigger on a Sheppard Stove and regret that now. Anyone have first hand knowledge of SO stoves or an alternative? I want it to be light enough that I am able to put it in my Ute if there is not enough snow to use my toboggan. I have the SO med. stov, which I use with their 6-person tipi. It works great, and impressively lightweight for what it offers. The trade-off for the weight and packability is that it requires some assembly and there are some small parts involved like wingnuts, etc. If you're camping in snow, it's probably a good idea to have a few of those extra small parts. Thanks for the quick reply and the sound advice. Would you stick with the medium or go up to the large, if you did it again? Craig - I'm in Canada as well. I had two SeekOutside wood stoves - a medium stove and a Sibling stove. Got them both before HPG released their Sheppard stove. I've since sold them and purchased a FourDog titanium stove back when the dollar was above par. For size reference, it was usually me and one other in a Black Diamond Megalight with a stove jack installed. Smaller tents are going to heat up quickly, even with a little stove. I wasn't ever going past -10C. If I was going with a collapsible wood stove again, I'd go with a larger stove. It'll dry out socks and boots better. I found trying to heat water on my mine kind of fiddly, but doable. 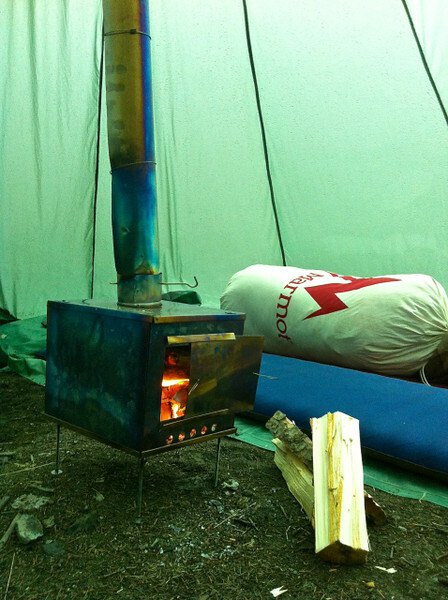 The Sibling stove was perfect for a quick blast of heat to push the moisture out of the tent. The medium stove was better for a more sustained burn. Both stoves were time consuming to set up, especially when cold hands are fiddling with small metal wing nuts that can disappear in the snow. In my experience they're great if you're base camping but work if you're setting up a new camp every day. A smaller wood stove also means you're doing more wood prep to get branches cut to the right length. That being said, they work for a lot of people. Build quality was great and they have great customer service. I only sold the stoves because I wasn't hiking them in anywhere - I use a pulk in the winter and a canoe in the summer. The FourDog stove sets up in under a minute and burns through the night. It seems to me that there is a Canadian manufacturer of titanium wood stoves in the west somewhere. Google keeps telling me it's "Genfabco", but they're based out of Ontario. I really don't know anything about them but thought I'd mention them. You might have luck finding a used SO stove on the myccr forums. Lots of good folks on there too. Chris - thanks for the info, I'll check out the other forums. A friend of mine swears by his 4-Dog stove, too. I am going to stick with a packable one for now. I will not be doing anything over a few days and it is not very cold in SE Ontario this year. As there is no snow here yet, I will want one I can pack into my Ute and not really on my toboggan. When I move back out West and retire, I'll get something more substantial in tent and stove. I noticed on the SO videos that the stove do look pretty fiddly and one will have to be extra careful when setting up. LiteOutdoors is located in Lethbridge, Alberta. I purchased a Ti stove from him last winter and have been very happy with it. I wanted a 3" pipe (standard model has 2.5") and Brennen was very accommodating. Nothing against SO, I have a Redcliff and a Cimarron and recommend them both... I do not think you would go wrong with an SO stove either. LiteOutdoors is who I was thinking of! Thanks Shu. There's lots of reasons to bring along a packable wood stove, regardless of manufacturer. I found it useful to have a big orange garbage bag to assemble it all on so I wasn't digging washers out of the snow. Enjoy, and let us know how it goes. On the question of med. vs large SO stove, I think it really just depends on the nature of the particular trip as to which is preferable. With the med. stove you have to cut the wood pretty short (10" or less) and with the large you have a couple more inches to play with. It's also 4 more ounces. I've started to get pretty picky about weight with my backpacking loads, but if I was pulling a pulk I'd go bigger. In a perfect world, I'd like to have two setups - a 'light and fast' version with the SO Redcliff or 4-person tipi, and then a basecamp setup with a large stove and an 8-person tipi. Thanks for the advice. I too, feel the need for the two set-ups. I am building up the light and fast one with my SO ideas. The basecamp set-up will be in a few years, when I retire. Has anyone used tents from Luxe Hiking Gear, they also offer hot tent options? The 2 most experienced Lightweight Wood Stove people I know say Seek Outside or Tigoat WiFi. And the biggest you can carry comfortably. Winnerwell Ti stove. Go check it out on YouTube. They are too fiddly and go together easier than most stoves with quick turn hasps. Good stuff. Got one for my Ti Goat shelter. This stove isn't the absolute lightest, even though it's Ti. But it's probably the best takedown unit made. And oh, it has accessories like hot water heat tank and even an oven. It can be one complete system. If you use it on a pulk or snowmobile I'd imagine the stove and oven would be luxurious. How many hours are you folks typically getting before you have to refill and stoke? Kind of depends on the age of the people you are camping with as you are going to be really lucky if you an get an hours worth of good heat from a large stove...I would definitely suggest warmer sleeping bags and a radiant barrier under your pads if you want to get any real sleep. If you are all old timers we tend to have to get up a couple of times a night anyway as nature calls so its not usually a huge hassle to restoke. When I was young the old timers would use a few big lumps of coal to easily restart things but not sure I would try that in a modern lightweight stove.